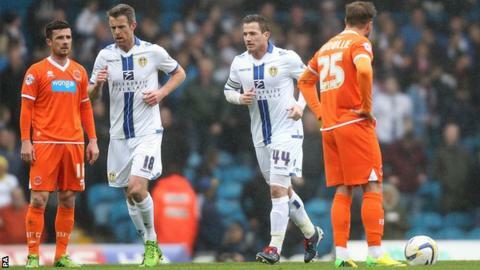 Recalled midfielder Luke Murphy scored twice to secure a first win for Leeds under new owner Massimo Cellino and heighten Blackpool's relegation fears. Murphy, back in the starting line-up after three games on the bench, opened the scoring from close range. Blackpool's best chance to level fell to Neal Bishop, who headed over. Summer signing Murphy struck again after the break, dinking the ball over goalkeeper Matt Gilks from an acute angle to end a run of five losses. The victory, Leeds' second in 13 games, puts 10 points between Brian McDermott's team and the relegation zone, but Blackpool are in trouble. Now 20th in the table, Barry Ferguson's side are just two points adrift of third-bottom Millwall and have won just two of their last 26 games in all competitions. The caretaker manager even restored himself to the team at Elland Road in an attempt to address the Tangerines ineffective form on the road, with their last away win coming on 2 November at Nottingham Forest. However, it was Murphy - a £1m signing from Crewe in the summer - who was more instrumental in the outcome of this game. He collected Ross McCormack's pass and neatly switched to his left foot, before finding the net for the first time since the opening day of the season. It was Leeds' first goal in 319 minutes of football and they continued to put Blackpool's defence under pressure with McCormack heading wide. Bishop should have equalised while David Goodwillie, playing alone up front, shot wide before the break. But once Murphy scored his second there was no way back for the visitors, although goalkeeper Jack Butland prevented Gary MacKenzie from scoring a consolation goal. "The win was a great relief. It was a big result for us. "We are on 50 points and that should be enough, but you can't think like that. I can only think about our next match at Barnsley. "Thank God we have got Massimo Cellino in charge because I didn't know where this club was going. The fans gave him a really good reception and I am delighted for him. We've all got paid and this club feels like a different, more secure place now." "We are disappointed that we came away with no points at all, but the level of endeavour from the boys was great. "We still have a lot of self-belief and we have to carry that on against Burnley. Our player-manager Barry Ferguson is totally self-motivated. Barry has the bottle to go out and play when the pressure is on. He will have no sad faces around the place and he was massive for us today." Match ends, Leeds United 2, Blackpool 0. Second Half ends, Leeds United 2, Blackpool 0. Corner, Leeds United. Conceded by Matthew Gilks. Attempt saved. Ross McCormack (Leeds United) right footed shot from outside the box is saved in the bottom left corner. Noel Hunt (Leeds United) wins a free kick in the attacking half. Foul by Andrew Keogh (Blackpool). Aidan White (Leeds United) wins a free kick in the defensive half. Attempt missed. Craig Cathcart (Blackpool) header from the centre of the box is close, but misses to the right. Assisted by Matthew Gilks following a set piece situation. Offside, Leeds United. Jack Butland tries a through ball, but Ross McCormack is caught offside. Attempt missed. Andrew Keogh (Blackpool) right footed shot from outside the box misses to the left. Corner, Blackpool. Conceded by Jack Butland. Attempt saved. Gary Mackenzie (Blackpool) header from the centre of the box is saved in the top right corner. Assisted by Barry Ferguson with a cross. Jack Robinson (Blackpool) wins a free kick on the left wing. Foul by Aidan White (Leeds United). Substitution, Leeds United. Aidan White replaces Marius Zaliukas because of an injury. Delay in match Gary Mackenzie (Blackpool) because of an injury. Delay in match Luke Murphy (Leeds United) because of an injury. Delay in match Marius Zaliukas (Leeds United) because of an injury. Attempt saved. Ross McCormack (Leeds United) left footed shot from the left side of the box is saved in the bottom right corner. Assisted by Luke Murphy with a through ball. Substitution, Blackpool. Andrew Keogh replaces Andrew Halliday. Goal! Leeds United 2, Blackpool 0. Luke Murphy (Leeds United) right footed shot from the right side of the box to the top left corner. Assisted by Ross McCormack with a headed pass. Hand ball by Faris Haroun (Blackpool). Attempt blocked. Michael Tonge (Leeds United) right footed shot from the centre of the box is blocked. Andrew Halliday (Blackpool) is shown the yellow card for a bad foul.